Peterborough United manager Steve Evans has been charged by the FA for improper conduct following his side's 4-0 defeat at Luton on Saturday. The Posh chief, who chose to sit in the directors box, where he could be heard constantly screaming instructions to his players, was distinctly unimpressed by referee David Coote's decision to send off defender Ryan Tafazolli midway through the first half. He left his seat ahead of the half time interval and headed to the tunnel as the players left the field, an action for which has since been charged. 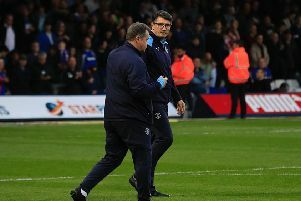 A statement by the FA said: "Peterborough United manager Steve Evans has been charged by the Football Association for making improper comments at match referee David Coote during Saturday’s 4-0 League One defeat at Luton Town. "It is alleged that his behaviour in the tunnel area at half time of the fixture was improper and his language in the match official’s changing room following the fixture amounted to improper conduct and/or questioned the integrity of the match referee. "He has until 18:00 on 25 January 2019 to respond to the charge."